A successful B2B marketing strategy means having more than a handful of diverse lead-generation tactics up your sleeve. In fact, 28% of B2B marketers use between five and nine content marketing tactics to drive leads, while 64% report using more than nine. In this article we share 25 lead generation ideas to try in your marketing funnels. From age-old methods that continue to work wonders to new, creative ways to get conversions, these strategies are guaranteed to help get you leads. When you hear the phrase lead generation, you probably, like most people, automatically think of the trusted ebook. As the most common B2B strategy, the ebook serves as an educational sample of your business. Either created from scratch or as a compilation of related articles, ebooks are easy and affordable to create and provide potential customers with free valuable expertise. People love visual content. It’s a proven fact. Entice potential leads with fresh content to present new concepts or statistics, findings of a case study, or to demonstrate a product or service. Online search for infographics has increased more than 800% in the past few years. They’re easy for leads to scan and understand and are the most shared piece of content, expanding your brand’s reach. For B2B businesses, webinars are likely the best way to get high quality leads for the future. They allow you to communicate face to face with leads all over the world and are a more personalized form of educating. They’re high value to your lead, giving them expertise and providing you with a quality lead. If someone’s going to commit to giving you an hour of their time, they have a strong interest in hearing what you have to say. A podcast is an educational digital audio file that you can email-gate like any other piece of content. Think of a podcast as a spoken blog article. It’s an engaging way to connect with leads by sharing your content, marketing your brand and educating in a new form. At Wishpond we have done podcasts with old blog content, used podcasts to interview guest experts and have created podcast series as seen below. Capture leads by giving them the chance to sign up for your blog content subscription. Exchanging their email for fresh daily or weekly content is worth it to someone looking for expertise and education. A subscription form on your blog is a necessity if you want to easily generate leads from your content. A great way to create buzz and awareness around your business, slideshare can also be a great form of lead generation. With a slideshare pro account, you get the added feature of lead capture. This means that partway through browsing your slides, a potential lead will be presented with the chance to enter their email for various content (as seen below). Just because you’re a B2B doesn’t mean you can’t offer discounts to potential customers. Reduce any hesitation potential leads may ahve about your business by giving them a discount on your product or service. Using it as a lead-gen strategy may be just the push they need to sign up, plus you’ll now have their email to target in the future. Jon Loomer uses a discount on his website for his online marketing courses in order to encourage conversions and get new leads and customers. One of our age-old favorites, case studies are the perfect content to use as leag-gen bait. 75% of marketers actually rated case studies as their main form of gated content. A case study may be time consuming to create, but can be used in many different aspects of your business. Potential leads who are interested in your business want to know about your successes. Email-gating a case study allows you to highlight your strengths and give real-life examples of how you’ve met clients needs. An industry report allows you to share industry trends and information with leads. What is making the highest ranked businesses successful? Potential leads in your industry or interested in your industry want to know about shifts, what competitors are doing and how your business ranks, etc. An email-gated industry report allows you to provide them with comprehensive information in one location for free. Who doesn’t love free things? That’s what I thought…no one. Offering a free trial of your product or service is a great way to capture interested leads, eventually nurturing them into paying customers. If theres no obligation, it’s one of the best ways to get potential leads to say yes. For potential leads interested in your product or service, a free consultation or quote gives them the opportunity to learn more about your business and if it’s the right fit. For most people, signing up for a free consultation means they have nothing to lose. For you that means lots of new leads which you can personally nurture through the sales funnel. Offering a referral program to existing clients provides them with motivation to help you generate more leads. An example can be seen below from AdvocateHub which helps marketers increase customer advocacy. By referring others to this business, they earn points which they can use in the future. No one know your target audience better than your existing clients, so let them help you catch new leads. A newer method of B2B lead-gen is to provide potential leads with the chance for their content to be reviewed or scored. Providing them with feedback about their product or service in return for their email means both parties gain valuable information. Use your expertise to tell them what they’re doing right or where they can improve. An example of this can be seen below as a Wishpond conversion optimization expert scores a client’s landing page. The benefit list: We love how you have focused on the benefits to the consumer of using your service rather than just listing the features. This tactic hones in on the true value for the client, telling them exactly why they should use your business. The customer testimonial: It’s succinct and compliments their benefits. Plus, it also details the exact person they quoted with a name, company, and location adding credibility and believability. The encapsulated form: This form stands out but doesn’t overwhelm the page like many forms do. It only has 3 form fields making it easy and quick to convert. It’s clear that the purpose of the page is to get the visitor to download their pricing and features. 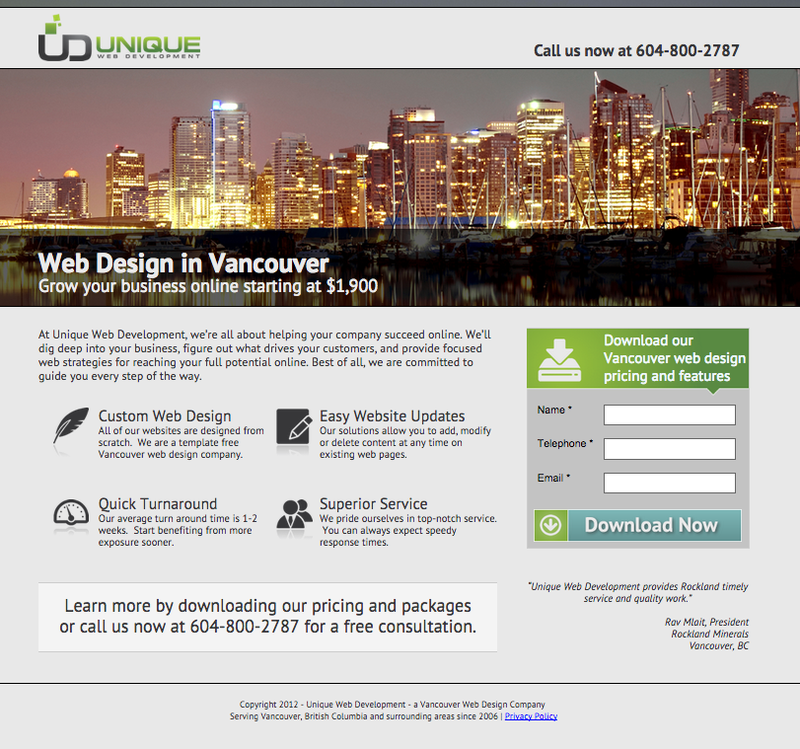 The price: You’ve nailed the fact that people looking for web designers are likely comparing your business with others. Price points can definitely be a deciding factor, so we like how you have listed a starting price that is easy to spot. The visual: As much as the photo of Vancouver is captivating, it’s not about to encourage a lead to download your form unless they have a soft spot for Vancouver. I would test using a photo that would be more useful, or even featuring a good example of one of your clients visually appealing landing pages that you’ve designed. The form’s offer: We recommend offering contact about designing a lead’s website as opposed to offering only pricing and features. This could be featured in a lightbox on your landing page. Making the customer testimonial more obvious: It’s hiding in italic font below the focal pricing and features form, which means your client’s attention won’t be on the customer testimonial. Place it in a more obvious space, making it larger and changing the font color to something that contrasts more with the gray background. A picture also adds to the credibility of your testimonial, ensuring potential clients that it is a true, honest review. A formula pack is a downloadable sample of formulas you can give to your clients. It is a free gated-takeaway that gives leads the chance to implement your ideas into their own strategy. Similar to an ebook, a tip guide provides leads with beneficial, educational information. The difference is that it’s usually presented in a list format (as Hubspot has done below) to make it an easy piece of content to scan. It’s easy to refer back to in the future and usually shares simple methods to success rather than long, complicated strategies. White papers contain rich content used to educate readers. They differ from a guide or blog post as they often contain statistical data and research findings which resonate with prospective clients. White papers speed up lead generation as they educate but also persuade readers to use your products or services. Giving away a template to a business lead provides them with an easy solution to a problem or need they may be facing. A template guides leads in a particular process and cuts down the time and effort they need to exert, crucial in any business. Neglecting video in your lead-gen strategy is a huge mistake. Videos are an engaging form of content that allow you to communicate your message in a clear, memorable way. Even a short 2-3 minute video captures your lead’s attention in a way that text cant. As one of the most sought after pieces of educational content, you should be using entertaining, relevant videos to rope in new leads. A free course is a great way to capture new leads and nurture them with information into a paying customer. Usually as a 4-8 part series, a course provides leads with valuable, in-depth information on a topic or a group of related topics. A course involves quite a bit of time and effort to create but is strongly esteemed content to leads. It takes them through a process from start to finish, compiled in one easy to find location. One of the most fun forms of lead-gen, a meetup means hosting social events for your local business community. It involves your business making new connections in your city or sector, and creating buzz around your brand. Meetups can be educational like small conferences or seminar nights, or just for fun like Wishpond’s recent startup foosball tournament. Invite others through a middleman or reach out to competitors and others in the industry and create a press release to spread the word. Promote it on social media and you’ll be presented with opportunities to network and gain contact information of potential clients. A click popup generates new leads but is not forced onto the viewer. It’s activted when a visitor clicks your campaign text or image. They are then presented with the offer. Click popups have a higher conversion rate than other popups as your visitor has to take the first action. It speeds up the process of the offer as viewers are not redirected to another page, they can convert on the spot. A scroll popup are a great way to generate leads from your business blog or website. They appear on the page once the visitor has scrolled past a certain point. This makes them effective for lead-gen as they a viewer part-way down the page has more info on your business and has shown more interest by getting to that point. For example, Social Media Examiner uses a popup once a visitor has gone 30% down one of their articles. Timed pop-ups can work wonders for your email list as they appear on a landing page or website after a visitor has remained there for a certain amount of time. Be careful with these popups as timing is crucial. You don’t want to turn away visitors by showing too soon, but too late and your visitors may already have bounced. After 20 seconds of being on Post Planner’s website, for instance, you will be hit with a timed popup. Often deemed as the most controversial popup, entry popups do work for lead generation. They are shown to visitors as soon as your webpage loads, and force your visitor to take action. While risky, they are effective. Your visitor has no choice but to convert, exit the pop-up or click away from your page, and you’d be surprised at how this can positively effect your conversions. MarketingLand uses an entry popup as soon as you arrive on their homepage to capture new leads. The last of the popup types but definitely not the least effective. An exit popup captures leads on their way out the door by appearing as visitors are about to bounce from your page. They encourage conversions or another page view, getting viewers to quickly reconsider if they’re actually ready to leave. In B2B exit popups are a great way to engage potential leads on your blog or website. To be successful in the B2B lead generation you should make use of an assortment of strategies. Yes, the age-old ones are still great, but only when supplemented with other new fresh ideas. Never overlook any of these strategies as they’re likely all easier to implement than you may think. It’s time for you to start capturing potential customers in new, enticing and exciting ways with your content.